Church of England officials will send a letter to Sony demanding an apology over the use of Manchester Cathedral as a backdrop for a violent computer game. They will ask the technology firm to remove images of the building from the game, and to provide backing to anti-gun campaigns in the city. A cathedral spokesman said the Church had received many e-mails of support. Sony said it had "all permissions necessary" to develop the Playstation game, entitled Resistance: Fall of Man. But Church officials dispute that, and earlier threatened legal action against the firm. The cathedral's David Marshall said Church leaders would meet on Monday to draft a letter and discuss what other action to take. Sony to support other groups in Manchester fighting against gun crime. 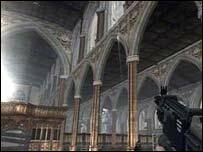 Community groups and MPs have expressed support for the Church's stance against the game, which has sold more than one million copies so far. Sony said it would contact the cathedral authorities on Monday "to understand their concerns in more detail".